Grammer MSG 20 narrow Pvc driver seat Reach truck seat driver seat. Grammer seat forklift Reach truck seat seat Construction excavator seat MSG 20 narrow PVC suitable for ao Jungheinrich, Still and Crown Item number: 1301172. Grammer MSG 20 narrow PVC Grammer Part number: 135671. 60mm axle travel Weight adjustment 50 - 130 kg Longitudinal adjustment 150 mm Backrest tilt adjustment (3 levels -5 ° to +15 °) Seat cushion width 410 mm. The seat is the seat will be delivered in black PVC!! The following numbers are for comparison purposes only. A 6362998 1394302002 1060029 000. 720.2577 215906-003 1060029 52026 233110 100047128 420320 ZS 0574 000. 720.2576 ZS 0574 52025 160194 424461 932328 219005 139901 1158496 1026783 1096883 135673 135671. Grammer Seat Cover Protector Maximo Offroad for Tractor Seat Slip Cover. Armrest right for Grammer LS95 LS44 DS85 MSG95 tractor seat Construction seat. Bronco Seats Basic Eco Fabric Tractor Seat Backhoe Seat Driver Seat NEW Sealed. 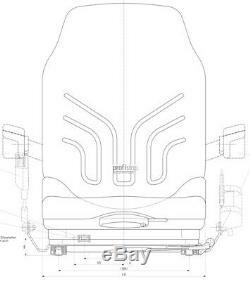 Forklift Seat PS12 GS12 low Suspension apt Anhui Heli Electro Diesel Electro Tug. Basic Star Tractor seat Loader Forklift Driver seat cloth Armrest Head Rest incl. 3 point automatic harness belt buckle stalk Universal 310mm Made in EU! Seat Cushion Seat Pillow fits Grammer DS 85/90 AR Black Fabric Tractor. Seat Cushion Seat Pillow Fits Grammer LS95 H1 / 90AR Fabric Black Tractor. Seat Shell Tractor Seat Excavator Small tractor for Kubota B1620 B6000 Mini. Compressor 12 Volt for Air Seats for Grammer KAB Isri Linde Still Tractor Forkli. Ford 4000 4600 4610 4630 7610 7700 New Holland Tractore Seat blue apt. Basic ECO Pvc Driver seat Tractor Front Loader Forklift seat DS85/90 NEW. Back Cushion Back Pillow fits Grammer DS85 / 90AR Fabric Black Tractor. 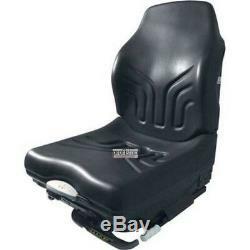 Seat Cushion Matching Grammer DS85 / 90 AR PVC Black Forklift Linde. Grammer Tractor Seat Fendt Deutz Case John Deere Msg 95G/721 Material. Armrest right fits Isri Lorry MAN TGA TGS Mercedes Actros Isringhausen Seat. Back Cushion Back Pillow Fits Grammer LS95H1/90AR Fabric Black Tractor. Grammer Slipcover Protecto Maximo off back Extension for the Driver's Seat. Armrest left for Grammer LS95 LS44 DS85 MSG95 tractor seat Construction seat. Seat cushion pillow suitable Grammer GS12 B12 Pvc Forklift Milling Excavator. Holder C650 C660 C5000 C6000 Bostrom Kab Narrow Gauge vineyard Tractor Seat. Grammer MSG 20 Pvc Forklift Construction Machine Seat Clark Linde Bobcat Toyota. Grammer GS12 B12 Switch Pvc 1127771 Seat Mini digger Cat Zeppelin Kubota Yanmar. Basic Star Pvc Tractor Seat Excavators Seat Seat Driver Forklift Seat Brand New! Seat forklift seat tractor seat suitable for Hyster Yale Zeppelin. Wir finden den passenden Sitz oder das passende Ersatzteil. Bestellen Sie die Ware auf Rechnung!! Bestellen Sie die Ware und zahlen Sie auf Rechnung! Sie bekommen die Ware vor Ihrer Zahlung! Nach Erhalt der Ware, haben Sie 2 Wochen Zeit, um die Ware zu begutachten und die Zahlung vorzunehmen. Artikel, Bilder, Teile, Original und Bestell-Nr. Dienen nur zu Vergleichszwecken und sind keine Herkunftsbezeichnungen. Die Nennung von Namen, Warenzeichen oder Markennamen erfolgt nur zu Zwecken der Zuordnung unserer Artikel. The item "Grammer MSG 20 narrow Pvc forklift Reach truck Seat Jungheinrich Still Linde" is in sale since Thursday, August 20, 2015. This item is in the category "Industrial\Heavy Machinery Parts\Seats". The seller is "fahrersitze-de" and is located in Kirchheim. This item can be shipped worldwide.